Building business relationships that will propel your career does not come naturally to most. Face it: superficial networking leaves some professionals wondering what could be a better use of their time. What is required in building great business relationships is having great people skills. Before you say to yourself, “I have that,” are you wondering what to do with all the business cards you’ve collected? Does LinkedIn still have you perplexed? Your people skills may need tweaking. According to a Harvard study, 85% of professional success comes from people skills. Plainly stated, professional success relies on your ability to build good relationships. Here are five meaningful and actionable keys that will help establish your reputation, navigate the “people chess,” and boost your understanding of the basics of solid relationship building. The beginning of good, solid relationships begin with rapport building, but how do you spark interest in someone you may not know? Many professionals spend countless hours at networking events, accumulate stacks of business cards that just sit there, and spend time waiting for people to acknowledge and accept their LinkedIn invitations. But what’s next when they finally connect? Like in dating, it really only takes a spark, but you can be deliberate about it. 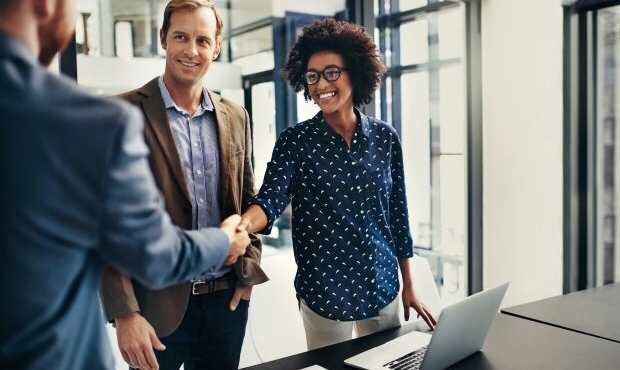 Check out five keys to power rapport building and learn how a great first impression can lead to more than just a passing recognition. Some say that you are only as powerful as your network. It’s true. Here is where your personal board of directors can provide you with the air and ground cover you need to provide that credible influence you are looking for to get others to want to build relationships with you. If you know that there is someone in another division, department, industry, or business that you’d like to establish a relationship with, check your linkage to that person. LinkedIn provides a visual means to do this with notes that show how many mutual connections you have with someone else. Those people can not only make an introduction, but they can also provide the credible recommendations you may need to get your relationship off to a good start. Apply that context to how you network in real life, and it still works. But it is very important that you establish your board of directors in an effective way so that they can support you in your quest to build meaningful relationships. DELIVER AND OVER-DELIVER. MERCHANDISE. REPEAT. Do something for the people with whom you want to establish relationships. Tackle a problem; make their work easier for them. For example, provide some smart advice or insight on how to improve their social media presence. In short, do good work and follow up. When our parents were navigating business environments, they would wholeheartedly espouse doing great work. In fact, they were proponents of going over and beyond. They were right. Do what your parents say. When it comes to executing, you need to kill it each and every time. But here is where your parents may give you the “side-eye”: You need to merchandise your work in a way that reaffirms it. The key that our parents missed when they said, “keep your head down and work hard” is this: How will anyone know your work if they never see it? It is your job to help them to see. A recent DiversityInc video focuses on how to build your personal brand. Business relationship building is personal brand building, inside and outside of your company. The second piece of advice in the video is to promote yourself. Yes, many of you clutched your pearls. It’s time to get over it. There is a way to do it that won’t make others cringe, and if you do it correctly, you’ll find that others will respect you and the work that you do. Merchandising your work can happen with the thought leadership that reinforces your work on that blog that you write, that panel where you spoke, even in an insightful LinkedIn post that you share. This is really about providing a credible context for your work from which you want your new contact to draw. Just make sure that the person you want a relationship with is in a position to be exposed to your message. Sometimes, it’s all about wielding the influence you have with sponsors who will gladly sing your praises to the person with whom you want a relationship. This is your air cover. Sponsors are those people who are likely in senior leadership roles who have earned the right to kick down doors for you, simply by the sheer heft of their position within the organization. This is very different than a mentor, one who is there to coach you along your journey. Sometimes a mentor and a sponsor can be one and the same, but frequently, these are two totally different people. How do you obtain a good sponsor? It’s a lot like dating. It takes two parties to express an interest and a pursue a relationship. With few exceptions, it’s probably not the best idea to approach someone and simply ask them to sponsor you. It is also reciprocal. Be willing to help your sponsors in ways that only you can, uniquely and often. Ever looked at that plant in your house and wondered why it’s withering? Chances are it needs a little more sunlight, or a bit more water. Ultimately, your plant is telling you it needs more time and attention. Relationships require that as well, personal ones and business ones. It takes dedicated time and energy. If you don’t make the time, know that you won’t foster great, career-propelling relationships. If you neglect the relationship, it will not grow. Like the plant, it will wilt. Schedule time with them, especially doing things with a mutual benefit. This doesn’t always mean coffee or golf. Sometimes, it is pitching in on a project, or supporting them in some way that will save them time. Think before requesting time from your new contact. Be mindful that they have a busy schedule. Ask yourself, what’s in it for them? Then be prepared to extend yourself before you ask them to extend to you. Building meaningful business relationships should be intentional. Don’t leave it to chance because your career journey depends on it. Want to jumpstart your linear and 360 relationship-building prowess? Check out my free eBook on the topic which includes a trilogy of articles with valuable builds.